What do you want to get you of the time that you spend? If you know the answer to that, start here. Our options can handle any number of participants, from the smallest of teams to the largest of groups. Who are the people attending? If you have a special group, select something special for it here. Whether your team building activity is aimed at motivating, inspiring, rewarding, educating, or all of the above, there’s a Sandstone event for you. If you’re serious about your team building efforts, you’ve come to the right people. We’re setting the standards for team building and we’ll change your perception of team building events – forever. 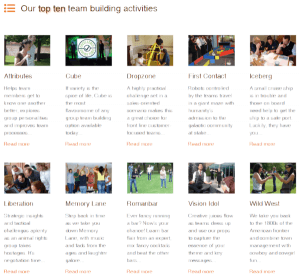 We deliver team building events that delight our contacts and our participants alike. Whether you are looking for a half hour fun team energiser, an intensive two days that will make a real difference to team effectiveness back at work or anything in between we have options that are really different to the norm. Our team building options really are unique. One characteristic that they all share is that we use technology to help us deliver them. The way that we have implemented this means that each of our options can handle a wide range when it comes to the number of people in the group. Our smallest group size to date is just 3 people. Our largest in person is 750. We also run online team building through our Global Team Building web site and the largest group we have handled there is 2,500. We’ve been delighting clients since 1992, so you’ll be in safe hands. Call us on 01829 580041, email us at email@sandstone.co.uk or fill in our contact form. We design and deliver our own activities. What this means is that we have unique team building options, so you’ll be offering your group something different, something new. We’re a family owned and run company, which means that we care about the quality of our service and client satisfaction. Check out our testimonials. All of our options can be delivered anywhere. As well as hotels and conference centres, we run at client sites, riverboats, town halls, church halls ... anywhere you would like!